Walk-through: Take a 10 step tour of the Moovly Studio editor, including the libraries, the Stage, object properties, etc. Help Center: takes you to the FAQs, which are regularly updated based on user feedback and new features. 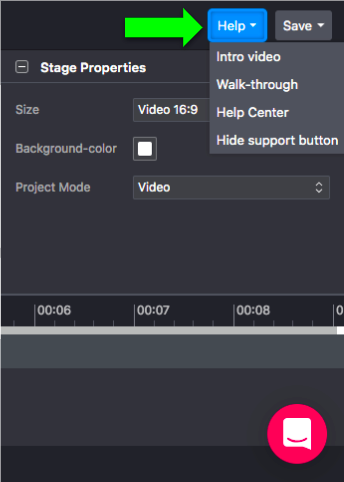 Hide support button: by default the support button (chat) is visible to all users (except for Edu Free users) within the editor. You can easily switch off, or make it visible again here. 🕙 Please be informed our Support team is available from Monday to Friday, from 9:30 AM until 5:30 PM CET. In the weekends our help desk is closed.